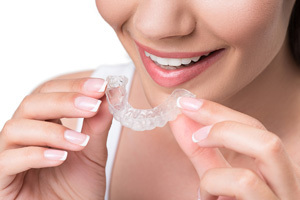 Morgan & Haupt Dentistry is proud to offer Invisalign® the low maintenance and convenient orthodontic treatment consisting of clear aligners that has successfully straightened the smiles of millions of adults and teens. Using a series of virtually invisible aligners that fit perfectly against your teeth, the InvisAlign system gradually shifts teeth into the desired position. The aligners are so clear and so lightweight that people won’t even know you’re wearing them – you might even forget yourself! Every two weeks, you simply pop in a new set of aligners until your treatment is complete.